Today’s topic is about the exceptional qualities that every Amazon store manager should possess. So what exactly is an Amazon store manager? There are so many aspects of selling on Amazon that most people are unaware of. So, an Amazon store manager is somebody who manages all of these aspects, whether it be for your own store or for a business owner who employs you to run their store for them. This is exactly what I do in my consulting agency, Kobel Consulting, where we offer services to businesses who just don’t quite understand how to sell on Amazon. They know they need to get their products listed and to claim that space on Amazon before someone else does, but they just don’t understand the ins and outs of selling on Amazon (or they simply don’t have the time or don’t need to learn because they’re the CEO or business owner). That’s where you and I come in! We can help other businesses by being their Amazon store manager or their Amazon business consultant. What qualities do you need to become a good Amazon store manager? The first and most obvious skill you will need to learn is how to sell on Amazon, since this is the skillset you are offering as a service. So, once you know how to sell on Amazon, what are the skills that you need to have in order to become an exceptional store manager? There are 4 key skills that you should possess in order to become the best Amazon store manager you can be. To be a great Amazon store manager, you need to have a yearning for knowledge and for continuing your education. Amazon is constantly changing their terms because they’re growing so quickly. For example, they’re currently beta testing for different seller programs, so as an Amazon store manager, you need to be able to keep up with Amazon’s latest offerings and opportunities so that you can then offer them to your clients. As an Amazon store manager, you need to be able to stay on the up-and-up and keep learning continuously about how to become better at selling on Amazon. And your clients will love you for it! To be an exceptional and effective Amazon store manager, you need to be able to adapt to Amazon’s always-changing ways. At my consulting agency, this skill is tested every single day. Sometimes, we’ve done something 100 times, and then the 101st time, the procedure has completely changed. That’s actually Amazon’s intent because they like to keep you on your toes and make sure you’re taking things seriously. This is why your position as an Amazon store manager is so needed by small business owners because they don’t have time for all of that. So, you need to stay on the up-and-up, roll with the punches, and adapt to Amazon’s ever-changing terms, conditions and opportunities. As an Amazon store manager, you need to be organized; you need to be consistent; and you need to have excellent follow-through skills. There are a lot of things that go on at Amazon where you need to contact their support and then follow up to make sure that Amazon is holding up their end of the bargain. In most cases, they’re not going to follow up with you. You need to be following up with them on a regular basis, which requires you to have exceptional organizational and follow-through skills and to stay consistent. The fourth important quality of an exceptional Amazon store manager is to have strong customer service skills. While it’s not going to be a huge part of your job, you need to be able to answer emails professionally and to understand that the customer is always right, especially in Amazon’s eyes. A good manager enjoys interacting with customers, usually via email or chat, responding to questions, and putting the customer first. 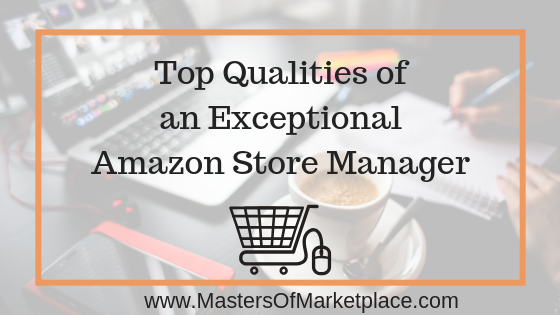 If you have these 4 qualities, you can become an exceptional and successful Amazon store Manager. Of course, before any of this, you need to know how to sell on Amazon. To learn all about running an Amazon store and eventually offering it as a service to others, join me in the Masters of Marketplace membership where you’ll have access to valuable trainings and information that can help fast track your success.